Success at the Gold Coast Commonwealth Games staged in early April, India excelled all expectations; on Sunday 29th July, their efforts were acknowledged. At a special ceremony organised by the Table Tennis Federation of India in New Delhi, the guest of honour was the Honourable Narendra Modi, the Prime Minister of India. Narendra Modi is well-known for his views that sport and not just cricket, for which the country is fanatical, is making notable progress in India and is increasingly a more than realistic career path. He recognises the fact that the country has an abundance of talent and that the task is to put structures in place to unearth and develop latent potential. 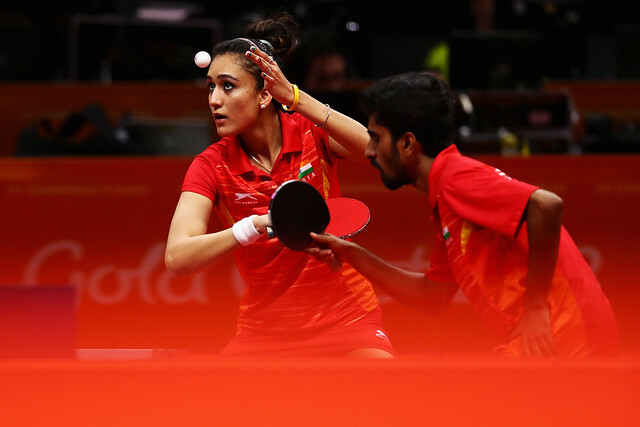 The efforts of the India Table Tennis Team in the Gold Coast underline his beliefs. Star of the show was Manika Batra who departed the east coast Australian city with medals in every event for which she was eligible. The win over Feng Tianwei in the opening match of the final against Singapore, set India on the way to a quite sensational three-one win. Later Mouma Das and Madhurika Patkar secured the doubles beating Yu Mengyu and Zhou Yihan, before Manika Batra returned to the action to defeat Yu Mengyu and end matters. Following the surprise win, there was a general belief in the Oxenford Studios that both Feng Tianwei and Yu Mengyu would learn from the experience and make amends in the Women’s Singles event; it was not to happen. Manika Batra beat Feng Tianwei in the semi-finals and then Yu Mengyu in the final. Two gold medals, in addition Manika Batra partnered Mouma Das to Women’s Doubles silver and Sathiyan Gnanasekaran to Mixed Doubles bronze. Mixed Doubles bronze for Sathiyan Gnanasekaran; earlier in the Men’s Team event it was gold. In harness with Sharath Kamal Achanta and Harmeet Desai, in the final, a three-nil win was secured against Nigeria’s Bode Abiodun, Segun Toriola and Olajide Omotayo. Additionally Sathiyan Gnanasekaran partnered Sharath Kamal Achanta to Men’s Doubles silver with Harmeet Desai and Sanil Shetty securing bronze. Three medals for Sathiyan Gnanasekaran; it was the same for Sharath Kamal Achanta, he concluded maters with one of each colour, he secured Men’s Singles bronze.